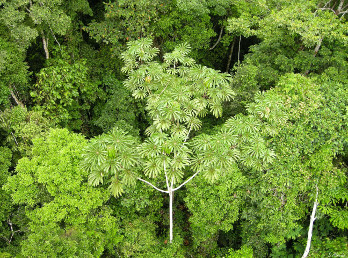 Much of the activity in the Amazon rainforest occurs close to the treetops, or at the “canopy” level, as it is known. Tree top walks give visitors an extraordinary window onto this hidden world. This is the natural habitat for lots of tropical animals and birds due to the abundance of leaves, flowers and fruits that can be found at this level. Another reason is that the branches at the uppermost level of the rainforest usually cannot support as much weight so lighter animals can nest here in relative safety from heavier predators. Canopy walkway systems are hanging networks of bridges, towers and platforms high up in the trees, normally at 25 m or more. They allow visitors to walk among the treetops and enjoy unrivalled views of the landscape below while having the opportunity to see the animals and birds that reside at those heights. Within the Taricaya Ecological Reserve there is a canopy walkway that consists of a 90 m suspension bridge that joins two platforms. The main observation platform is considered by many to be the highest canopy platform in South America, at 42 m (138 ft.) high. Visitors use safety harnesses to cross the bridge. Some lodges take groups here, including Amazon Planet or you can contact the Taricaya Project itself. The Inkaterra Canopy Walkway is A 344 m (1,135 ft.) long network of seven hanging bridges, eight treetop platforms and two observation towers. The highest points of the circuit are 29 m (95 ft.) high. Complete with interpretation centre. 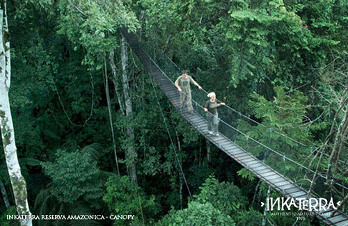 All visitors welcome with an entrance fee or included with stays at Inkaterra Reserva Amazónica. Suitable for children. A 25 m (82 ft.) high canopy tower on the premises of the lodge Refugio Amazonas. As well as great for spotting wildlife, it looks onto the crowns of huge Brazil nut trees. Guests at this lodge and those who book at Tambopata Research Center are taken here. Suitable for children. A 30 m (98 ft.) structure with three levels, each giving a distinct perspective of the rainforest. Guests at Posada Amazonas are taken here as part of their booking. Suitable for children.